Up until yesterday I was conflicted - but now I'm sure! These casual toffee bootcut pants arrived yesterday, and I adore them. Greg LOVES them. Sam gave his loud yap of approval just a moment ago too. How can I not keep them. GORGEOUS drape and fabric. Stiff and substantial, but soft. Stretchy so very comfy. Perfect for the enormous amount of plane travel that I do. I love them with my big white sneakers and a semi or fully tucked top. All sorts of jackets and coats will work. FRESH. The colour is delicious. Absolutely NO HEELS for me and this look. Flats all the way. ETA: Nice with my new scarves and bag. I am very happy for you Angie, looks like a perfect addition to your color scheme this fall. Can't wait to see pics. Out of curiosity, what is the rise on these pants? 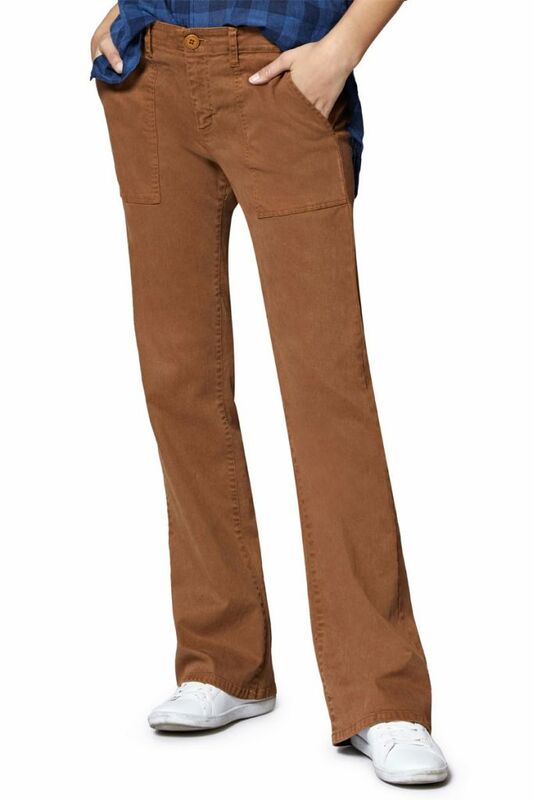 I am considering a pair of pants in this color but will likely for something dressier as they will not be worn with sneakers, but dressier low heeled shoes. I’m glad you found such an attractive, comfortable and stylish pair of pants that are perfect for travel. And it is so useful to see how you adjust your color palate and silhouette over time. Tanya, the front rise is 9.5 inches in a size 25. The fit is tailored - not body con at all. Nice bit of tailored room. The inseam is 32.5 inches. I need 32 to wear with my flats. La Ped, time to track down a tailor! I can soooo se you in these. Fab with the navy and mustard you like. Barbara Diane, what a sweet thing to say. YES. Like to feel fab and practical when I travel. Since I don't wear Athleisure, this is one way to go. Thanks Angie, that is about as low as I would go. And the length is perfect for me for 1.5" block heels (my legs are shorter than yours). I am going to give it a month or so to see if I can find something dressier and if not, I will revisit this option. Sounds good, Tanya. EXCITING, isn't it. One way or the other it lives happily in my closet:) and will be paired happily with the purple midi skirt in a couple months! I love the colour and pockets front and back. Will look great with your fall colour scheme. Do you have a toffee/cinnamon handbag? These will look terrific on you - especially with that beautiful cashmere wrap. Can't quite wrap my head around bootcuts with flat sneakers for myself (too boyish , and I think I'd feel short ) but I get the appeal for plane travel etc. LOVE the new colour . Suntiger, either way - delicious. Lisa p, YES. I hear you on NOT wanting to look Tomboy in these. Cute on others like La Ped who wants to look Tomboy - but that's not where I'm at on this leg of my style journey. That's why I'm showcasing my waist and wearing a more fitted top. AND always with my pearls. How fun to throw in some of my fitted blazers too - see Finds. I LOVE how it all comes together! Smittie, no bag in toffee. Sticking to belts and footwear for now. Check Finds. Those are a PERFECT colour match when shopping my closet. Wow! You are embracing caramel toffee full on! Love it with the light blue. Very fresh. Glad you found such perfect bootcuts! That’s a great color for your new capsule. You mentioned chunky sneakers to me in your blog responses the other day, and I’m unsure about them. I don’t care for big white sneakers for myself (at least I don’t think I do — I’ve never tried them, but I’m not keen on white shoes on me in general). Any suggestions? I have sneakers from years past that are not necessarily chunky. Probably not on trend enough for this kind of look. How about pointy-toe flats? Chunky loafers? Sorry to piggyback on your post! RunCarla, I know! I LOVE adding a new colour to my wardrobe and making it work. It's thrilling. I enjoy fitting together the puzzle pieces, IYKWIM. Rachel, your turn to embrace toffee. Janet, I like the look of the SM Arctic sneakers, the gold sneaks, the running sneaks and the snake skin loafers with bootcuts for you. Try those! You're all legs anyway - I wouldn't worry about a thing (As for white footwear - easier for me with blonde hair. Also, you should try a white/cream & black shoe instead). Gorgeous pants I adore color. Sounds like a total win to me. Enjoy your new pants. Angie, I find myself smiling as I look at these nice new bootcuts of yours, because they remind me of a similar pair I wore in the fall of 1974. Mine were a bit darker, and I wore them with leather flats in three shades of brown. Fun to see old trends coming back. I am sure that both the lines and the colour of these trousers will be perfect for you. And toffee, white and light blue is a delicious combo. Super thrilled with this post, as I am wearing the best shoes ever, Ecco Soft 7 sneakers, just delivered today. I want to style them with all the things. They love my low volume feet right out of the box, and they have arch support. I hadn't thought of boot cuts, but now I will. These pants are the 2018 update for the WHBM embroidered cargos! Look how gorgeous they'll be with navy, too. WINNING. I like the color. I used to wear it a lot. I like that you’re planning to wear the pants with sneakers. Lovely bootcuts, really sweet! They will look SO beautiful with the tweed equestrian jacket -swoon! And that beautiful brooch of yours, perhaps? Can’t wait to see your new outfits, Angie! The Cat, I LOVE hearing about the '70s - one of my favourite fashion eras. I bet you looked smashing. KikiG, YAY. Please share the Eccos sneaks. My low volume feet find them too wide no matter what I do. Mirjana, thanks for the cheerleading. You are a sweetheart. Katerina, YES. My beautiful brooch. FABULOUS idea! You clever lass. Thanks for the feedback, Angie! I love the idea of your equestrian jacket with your new pants. I had forgotten how much I like that brooch. Nice to see it again.